We have settled into Nome. It has been a crazy month. 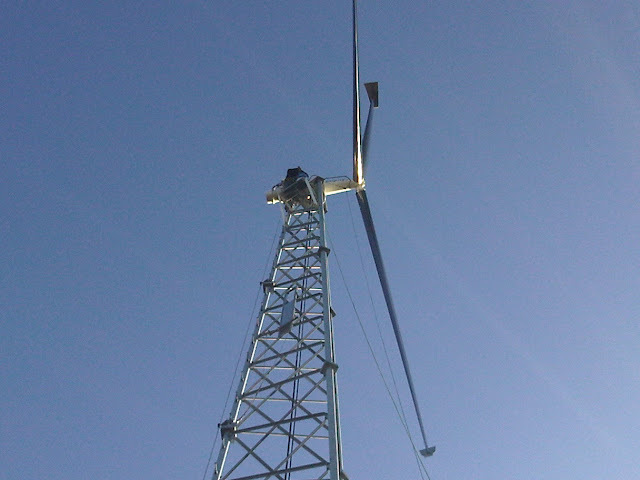 About six hours after landing in Nome I got a job climbing wind towers on the largest wind farm in Alaska. Deb has gotten a job as the acting director of head start over 13 schools. Jannelle and Bianca are in school and loving it. We have found an apartment vacated by a mining crew that is fully furnished, including the biggest television I have ever seen. We now have a TV, the first and last TV we owned we sold one year into our marriage. I had an interesting conversation with the internet provider here who only sells internet bundled with a cable package. She could not believe I didn't want cable. "You have never been through a winter here have you? ", she said. We worked out a plan that included a cell phone rather than cable. We have also borrowed a 4wheel drive full size van that gets about 5 miles a gallon. It sorta even stops when you push on the brakes. Precipice is out of the water and safe in a cradle. 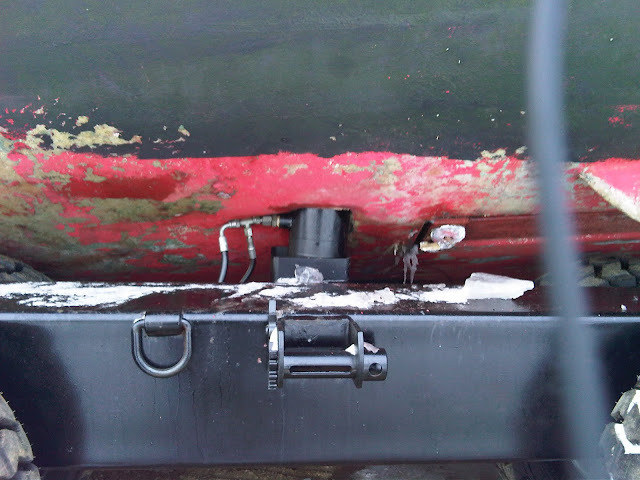 The boat pulled out after us was destroyed when the trailer's hydraulic arms snapped off. We were glad it wasn't us, but we feel their pain. Now we aren't sure how we are getting back in the water. Hopefully the trailer will be repaired by then. Our liferaft hasn't shown up, and we don't expect it to. The engine on Precipice is apart and parts are on order. We have decided to repair the old engine for now. We lose six minutes of daylight every day until we only have four hours of sunlight Dec 21. We make up for that in June with 21 hours of sunlight. 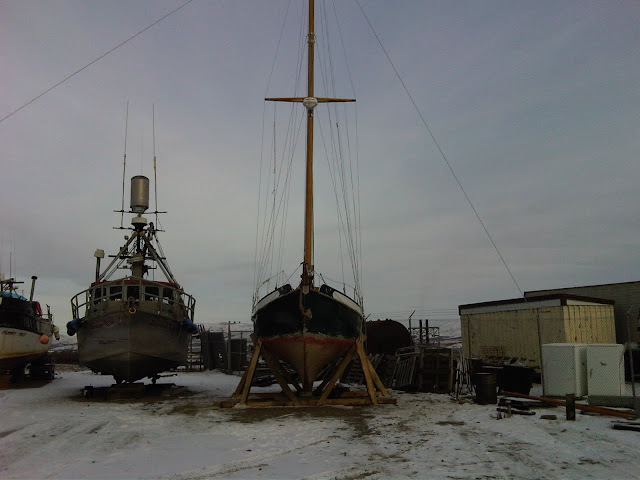 The town of Nome is truly a frontier town. My neighbor across the street has his airplane parked in his front yard. Every home has at least one 4wheeler and a snowmobile parked in front of it. We have been helped by many here from lending us a vehicle (thanks Glen and Sue) to giving us a vanload of lumber to build a cradle (thanks Jim). My beloved ASUS W2J laptop died after more than three years of service. I have purchased a new laptop, but I have not had a chance to download everthing out of the old into the new. I do not have skype set up, nor do I have my Adobe Suite installed. I haven't caught up on email yet either. So email, phone, and website are all still behind. I will get to it. What have I been doing? I have built a cradle for the boat and dissasembled the engine. I have been preparing a course I am teaching back in Grand Rapids (more on that later) I have been writing querys for magazines, and I have been doing all the things that we have put on hold for the last five months to pull off this trip. I find myself very busy. We are going to be back in Grand Rapids, the first time in over 500 days. We leave here Dec. 20 and return the first week of January. I will be training a couple of technicians for a local shop and the girls will be on winter break goofing off with family and friends. It will be good to be back for a short while. 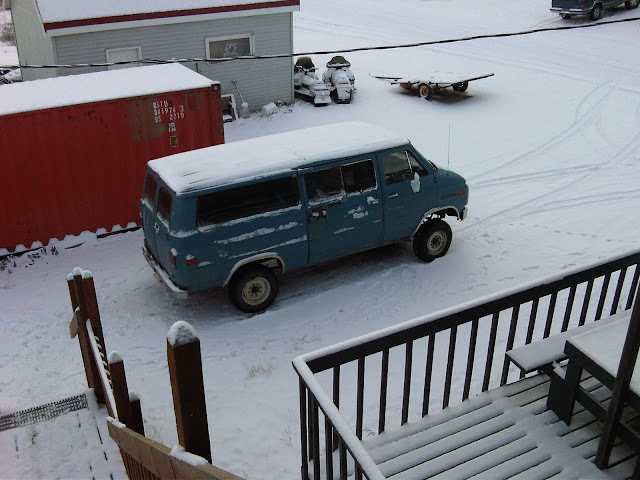 Our trusty four wheel drive greenhouse gas machine. The boat after us was destroyed by the hydraulic rams breaking. Ouch. I spent three weeks climbing 100 foot towers. The harbor froze over the day after we pulled precipice. 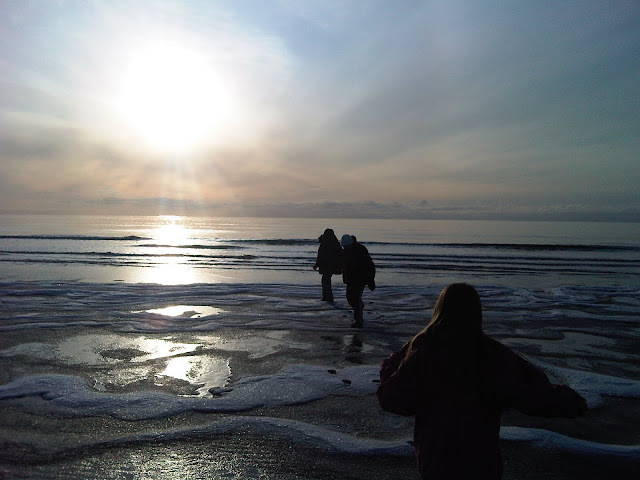 The ocean is just starting to freeze.